Dante is not just any poet. With his epic poem “Commedia”, in English “Divine Comedy” he created an Italian cultural Monument, a journey through Hell, Purgatory and Paradise full of symbols, archetypes, historical and allegorical references. The article wants to revisit the work of Poet Dante Alighieri from a Jungian view in the light of 2015. Dante’s Commedia was written from 1307 to 1321 and is the most famous Otherworld journey of world literature. Accompanied by Virgil, the poet passes through the Gates of Hell to the icy center of the earth, and from there to the paradise flying high with his beloved Beatrice. On the way, he meets almost six hundred celebrities from politics, literature and mythology for their salvation, repent of their sins, who tell the poet of their life. It was a longitudinal study of the Western World at that time. 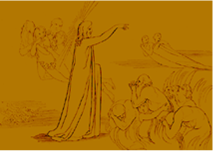 See above a short powerpoint as an introduction if you are in the visuals or not sure to where this article will lead: Dante in a hurry. My answer is yes. Yes, period. Not only, because i every time you go in a museum, you will find pictures representations of Dane’s allegories and poems. Like Dante sensed a big transition. our world seemingly falls apart. We all know, that transcendental illiterates try to create a paradise on earth, but achieved hell. Jihadists have created hell on earth to get into their paradise. Could it be, that one or more of Dante’s circles is as subversive today as it was then? 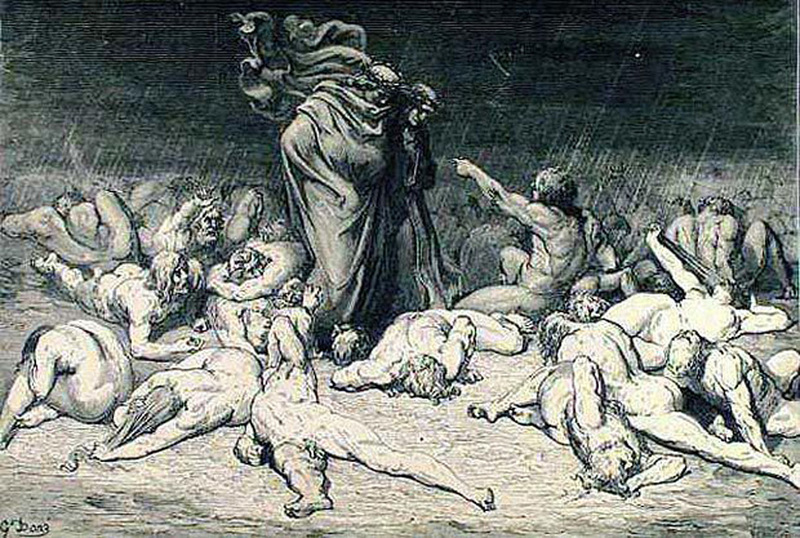 As a reader of my blog might expect, I am interested in Dante’s reflection in art and society and last but not least of his concept of evil, since the 34th song of his journey inspects Lucifer himself. Why does he act as he does? When it so often looks like “The Good loses,” why should anyone be good? The human rights organization “Gherush92” has claimed some chants of “Commedia” are full of racist, anti-Semitic and Islamophobic stereotypes and by the way, I add not even equal opportunity – fewer women suffer in hell. For the contemporary reader it is, however, not only the scholarly high sea of political correctness, in which they could get lost. 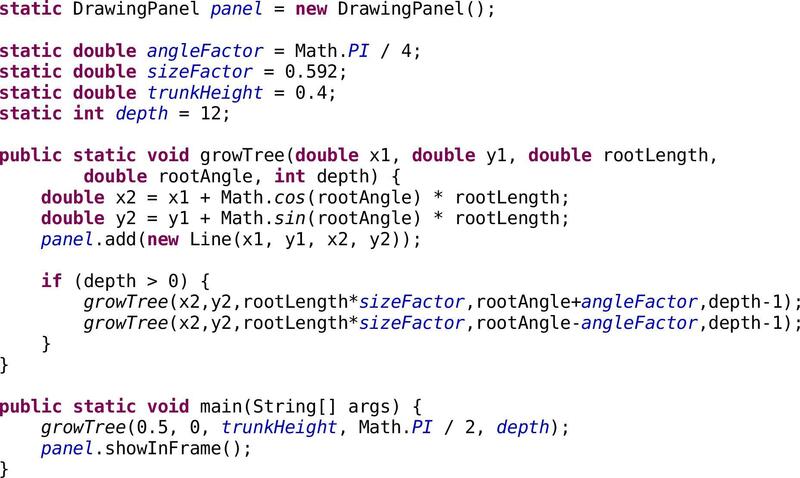 Further difficulties are added: spatial, temporal, and formal ones. Hell’s entrance is near Florence with the circles descending to Earth’s centre; sketch 5 reflects Canto 34’s inversion as Dante passes down, and thereby up to Mount Purgatory’s shores in the southern hemisphere, where he passes to the first sphere of heaven at the top. Around the earth revolve in outward increasing speed nine concentrically enclosing transparent hollow spheres. Seven blessed spheres with the earth as center and five planets known in his time have attached the heavenly bodies: Moon, Mercury, Venus, Sun, Mars, Jupiter and Saturn. The ninth circle are the fixed stars, identical with what “le stelle” at Dante’s. Beyond those nine celestial spheres is the seat of the supreme deity, the empyrean, “cielo di fiamma o vero luminoso or “the light and flame sky – itself immobile – like the earth. This heavenly scheme is matched by Dante’s topography of the ‘Purgatorio’ and ‘Inferno’. The Purgatorio rises on the apex of the uninhabited area covered by the ocean opposite to Jerusalem. It is the location of the passion and death of Jesus Christ, and also divided into nine districts. At the bottom of the beach belt land, the souls that are shipped to death first wait on a ledge and into a ravine for the entry in the actual Purgatorio, located on the ring terrace The Prayer and Purification passage leads through seven by rock walls separated ring terraces. 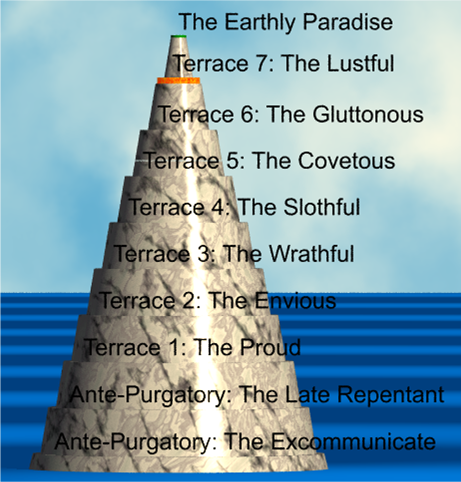 On the top is the abandoned earthly paradise. 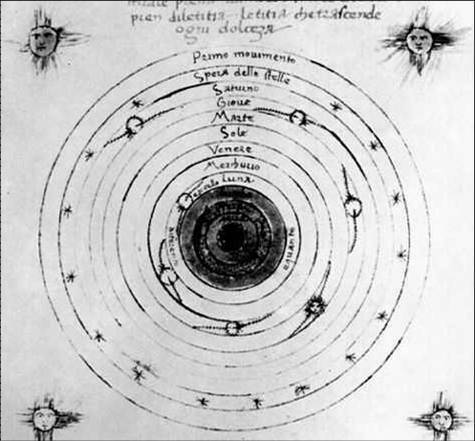 Likewise, the Inferno is precisely located in the Ptolemaic system of Dante. Hell corresponds to the conical Purgatory at its negative hollow image. It is located in the interior of the inhabited hemisphere. Lucifer has bored with the insubordinate angels after his fall into the earth to its center. Thus, the funnel-shaped narrowing again be divided into nine circles Hellmouth has emerged. Where did the displaced Earth’s mass go? In this creation model, it was reused as material for the Purgatory and therefore the mountain’s height matches the hell crater’s depth. Poets write for eternity, but within a Zeitgeist. Dante had his contemporary readers in mind, to achieve certain political effects. Much of this vision of the afterlife is therefore based on the period of history and culture he lived in. Naturally, as in any art, this requires explanation, if the context is not there anymore nowadays. 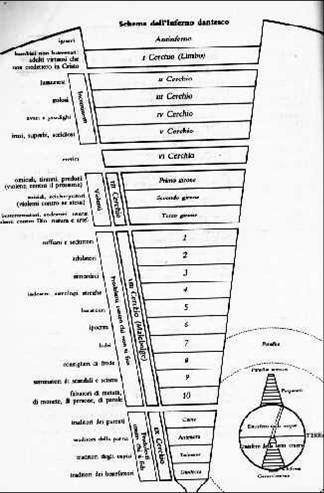 Like his topographic structure, are the conditions in Dante’s temporal structures coherent whole. Its center is natural is located in Rome. As a matter of fact, in a trinity of Rome. The Classical Rome of Augustus, the New Byzantine Rome and the Rome of the Holy Roman Empire – the papal Rome. The history of the latter began on Christmas in the year 800 with the coronation of Karl (Karl the Great) to the Roman emperor, executed by the pope Leo III. Around 1160 the official denomination Imperium Romanum changed into Sacrum Imperium and 1254 the empire was named Sacrum Imperium Romanum and became in the 15th century the Holy Roman Empire of German Nation. The title of the supreme monarch was initially “king”. The emperor’s honor could only be achieved only by the coronation of the pope. 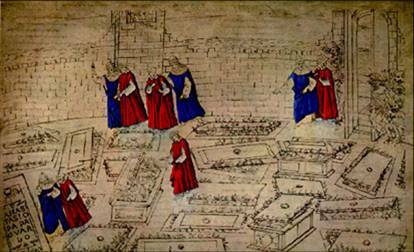 As an ambassador of his native city of Florence, Dante came 1301 AD to Rome. The contradiction between idea and reality on court of Pope Boniface VIII traumatized him. Jerusalem, taken 1099, was lost 1187, but the Crusaders had relocated their dwindling Kingdom of Jerusalem to Cyprus around 1300 but the Mamluks besieged and captured the last Templer fort Ruad in 1302. Constantinople would hold only 150 years more. 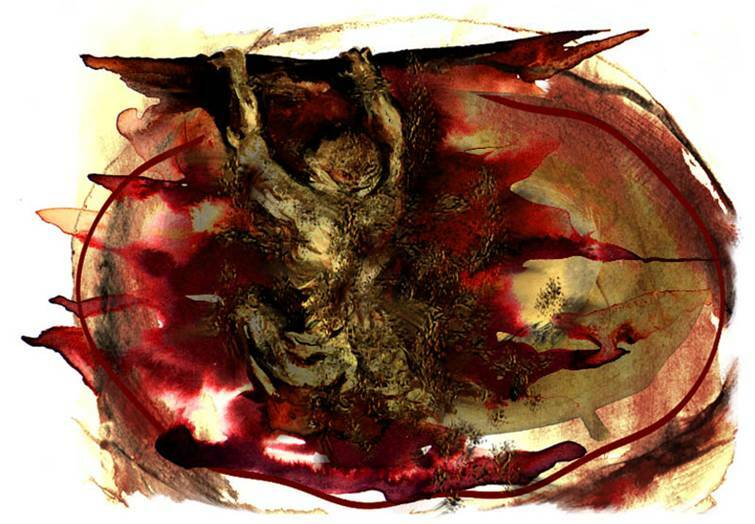 Dante’s central idea is of unity and continuity of Roman and to him this is world history under the sign of the eagle. In the sixth canto ‘Paradiso’ the Eastern Roman Emperor Justinian (527-565) describes the trajectory of the eagle (the Roman character) together with history lessons. As the author of the corpus juris civilis, on which the Napoleon code and the whole Western legal system is based. Justinian is the representative of the Roman Empire. The eagle will start with Troy westward to Lazio. Under Augustus, the conquest consolidated in the golden Aion. Constantine, who moved his residence 326 moved to Constantinople against the natural and divinely ordained east-west direction and through the donation of the Papal States, repealed the division of sacred and secular rule. The Imperium Romanum was for Dante the epitome of everything that he wanted to see realized in history. Not the Sacrum but the center of the Civitas Dei, with its dual objective: eternal blessedness of the man through the exercise of the theological virtues (faith, hope and love) – under the leadership of church; earthly well-being through the use of intellectual and moral faculties – under the leadership of a worldly State with Plato’s virtues (Prudence, Justice, Courage, Temperance). More problematic is the difficulty in understanding the political references: What can we do with them now? They include all a closed world view: Catholic of the Middle Ages. That is why one meets a lot of Popes and even Mohammed in Dante’s hell. To him, a natural state order has its historical origin in the classical Roman Empire. To me this the first glimpse into the area of enlightenment, to invoke a secular (one might say pagan) legitimation of power again. In Northern Italy’s political struggle between Guelphs and Ghibellines, Dante was part of the Guelphs, who in general favored the Papacy over the Holy Roman Emperor. Dante wrote in his political credo in ‘De Monarchia’ about the basic relationship between empire and papacy (Imperium and Sacerdotium), or secular and religious rule. Only in the harmonious coexistence of the two powers Dante saw a guarantee for a just and peaceful world order in which the salvation of humanity can be accomplished. Florence’s Guelphs split into factions around 1300: the White Guelphs, who opposed secular rule by Pope Boniface VIII and who wished to preserve Florence’s independence, and the Black Guelphs, who favored the Pope’s control of Florence. Dante was among the White Guelphs who were exiled in 1302 by the Lord-Mayor Cante de’ Gabrielli di Gubbio, after troops under Charles of Valois entered the city, at the request of Boniface and in alliance with the Blacks. The Pope said if he had returned he would be burned at the stake. Dante has decided, his main work in the so-called vernacular: in Italian and that was all but self-evident at that time. The Italian cannot be seperated from the ‘Divina Commedia’. However, its rhythmic form, the tercet, does not occur in Italian poetry. Three verses are together, of which the first and third rhyme, while the second rhyme will be picked up in the next Tercet. So the terza rima form an elaborate chain. Three 3 cantiche, each formed of 33 cantos, adding up to 99, which with the addition of the first introductory canto, adds up to 100. The Poem is written in Teresa Rima: 3 line stanzas with a rhyme scheme aba, bcb, cdc, ded etc, so each rhyme is used 3 times. The big Munich Romanist Wilhelm Ritter von Hertz, whose translation of the ‘Purgatorio’ and the ‘Paradiso’ I use, dominates the iambic rhythm, rhyme and the trisection. The three rhymes belong to the center of Dante’s symbolism ultimately, together with the Trinitarian concept of God. The symbolism of numbers plays in the ‘Divine Comedy’ a very important role just as with C.G. Jung. Each of the three main parts of the work, called cantiche , consisting of thirty-three songs, canti, which indicate the years of the life of Christ. An additional song of the introduction is to increase the total number of canti to hundred. The hundred is ten times the number ten, which, according to the View in Dante’s was a symbol of perfection. The Inferno is divided into nine circles and the court; in the ‘Purgatorio’ there are pre-Purgatorio and the earthly Paradise on the top of nine circles; the nine heavens are completed by the Divine Office: the empyrean – again to number ten. The three-rhyme has not only aesthetic, but symbolic, one might almost say metaphysical significance. The whole work is almost saturated with symbolism. Here are more difficulties for the contemporary Dante reader. Without reading scholarly commentary, the symbols remain a very superficial affair. For example, refer the three wild animals in the first canto of the Inferno to the main vices: Sensuality (Panther), Pride (Lion), Greed (wolf). 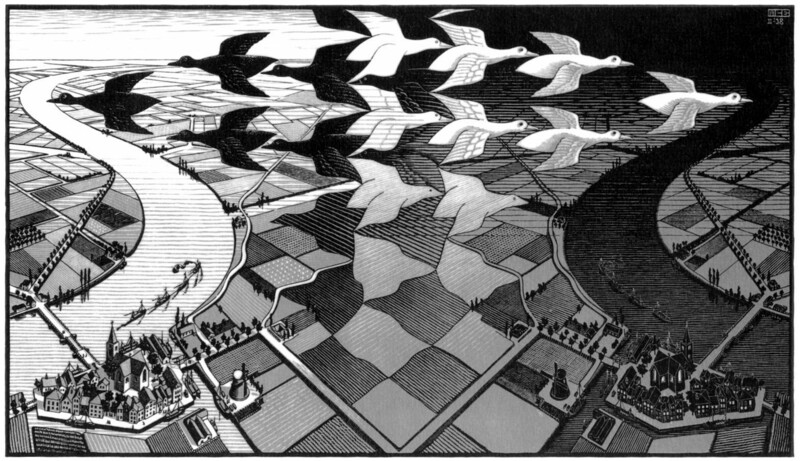 Whether something is right or left, to Sun and Star is never random. In the architecture of the poem, there are numerous, but not obvious correspondences. For example, the sixth Song of the ‘Paradiso’, in which, as mentioned, the Roman eagle represents the continuity of world history has an inner relationship to both the sixth canto of the Inferno and the ‘Purgatorio’ – pointing to the different factions in Florence. Here reside the unbaptized and the virtuous pagans, who, though not sinful, did not accept Christ. Heaven does not claim them, Hell does not want them. They are not punished in an active sense, but rather grieve only because of their separation from God, without hope of reconciliation. Without baptism (“the portal of the faith that you embrace”) they lacked the hope for something greater than rational minds can conceive. Limbo includes green fields and a castle, the dwelling place of the wisest men of antiquity. Lust Blown about in darkness. 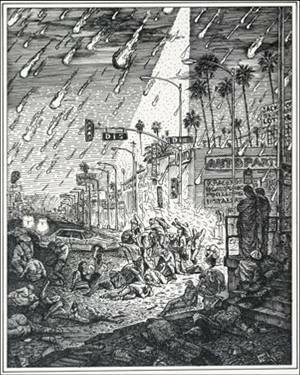 Those overcome by lust, are punished by violent storm in this circle. Blown about in darkness. Dante condemns these “carnal malefactors” for letting their appetites sway their reason. They are the first ones to be truly punished in Hell. These souls are blown about to and fro by the terrible winds of a violent storm, without hope of rest. This symbolizes the power of lust to drive one needlessly and aimlessly. Gluttons are forced to lie in the mud under continual cold rain and hail. Deprived of individuality. Each is alone, cold, and miserable. Cerberus guards the gluttons, forced to lie in a vile slush produced by ceaseless foul, icy rain (Virgil obtains safe passage past the monster by filling its three mouths with mud). The gluttons lie here sightless and heedless of their neighbours, symbolising the cold, selfish, and empty sensuality of their lives. Just as lust has revealed its true nature in the winds of the previous circle, here the slush reveals the true nature of sensuality – which includes not only overindulgence in food and drink, but also other kinds of addiction. In a swamp-like water of the river Styx, the wrathful fight each other on the surface. The sullen lie gurgling beneath the water, withdrawn “into a black sulkiness which can find no joy in God or man or the universe.” Phlegyas reluctantly transports Dante and Virgil across the Styx in his skiff.The lower parts of Hell are contained within the walls of the city of Dis, which is itself surrounded by the Stygian marsh. Punished within Dis are active (rather than passive) sins. The walls of Dis are guarded by fallen angels. Oh well, fallenangel. Heretics are trapped in flaming tombs of the City of Dis. Heretics, such as Epicurians (who say “the soul dies with the body”) are trapped in flaming tombs. Pausing for a moment before the steep descent to the foul-smelling seventh circle, Virgil explains the geography and rationale of Lower Hell, in which violent and malicious sins are punished. In this explanation, he refers to the Nicomachean Ethics and the Physics of Aristotle. In particular, he asserts that there are only two legitimate sources of wealth: natural resources (“nature”) and human activity (“art”). Violence, to be punished in the next circle, is therefore an offence against both. Violent against people and property, are immersed in Phlegethon, a river of boiling blood and fire, to a level commensurate with their sins: Alexander the Great is immersed up to his eyebrows. The Centaurs, commanded by Chiron, patrol the ring, firing arrows into those trying to escape. In this ring are the suicides, who are transformed into gnarled thorny bushes and trees, excluded from resurrection. Here are the suicides (the violent against self), who are transformed into gnarled thorny bushes and trees, which are fed on by the Harpies. Unique among the dead, the suicides will not be bodily resurrected after the final judgement, having given their bodies away through suicide. Instead they will maintain their bushy form, with their own corpses hanging from the limbs. The trees are a metaphor for the state of mind in which suicide is committed. The other residents of this ring are the profligates, who destroyed their lives by destroying the means by which life is sustained (i.e. money and property). They are perpetually chased by ferocious dogs through the thorny undergrowth. Panderers and seducers walk in separate lines in opposite directions, whipped by demons. Those who committed simony are placed head-first in holes in the rock, with flames burning on the soles of their feet. One of them, Pope Nicholas III, denounces as simonists two of his successors, Pope Boniface VIII and Pope Clement V.
Sorcerers and false prophets have their heads twisted around on their bodies backward, so they can only see what is behind them and not into the future. Corrupt politicians (barrators) are immersed in a lake of boiling pitch, guarded by devils, the Malebranche (“Evil Claws”). Hypocrites listlessly walking along wearing gold-gilded lead cloaks. 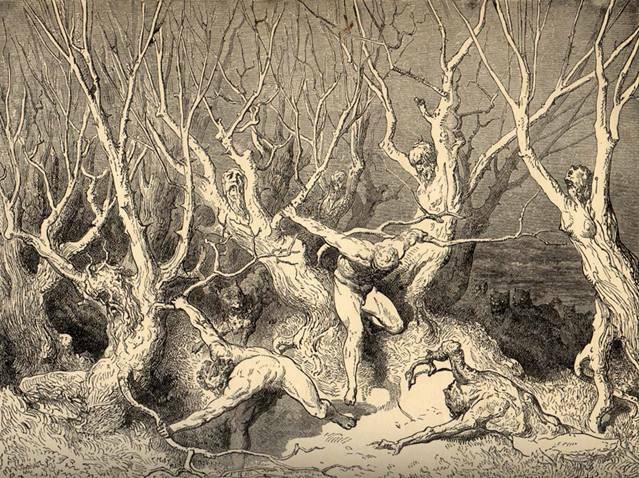 Thieves, guarded by the centaur (as Dante describes him) Cacus, are pursued and bitten by snakes, which make them undergo various ugly transformations. A sword-wielding demon hacks at the sowers of discord. As they make their rounds the wounds heal, only to have the demon tear apart their bodies again. Muhammad tells Dante to warn the schismatic and heretic Fra Dolcino. (Cantos XXVIII and XXIX). Groups of various sorts of falsifiers (alchemists, counterfeiters, perjurers, and impersonators) are afflicted with different types of diseases. 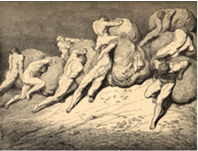 Ninth Circle (Cocytus) – The Treacherous (Canto 34). 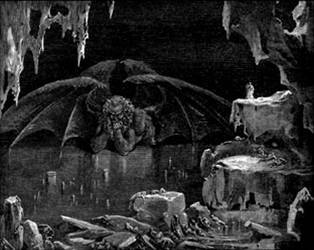 Satan is trapped in the frozen central zone in the Ninth Circle of Hell, Inferno. The Ninth Circle is ringed by classical and Biblical giants. 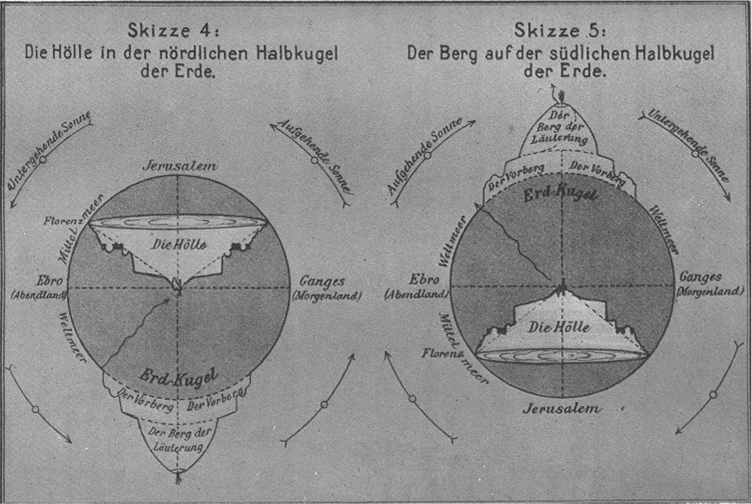 Each group of traitors is encased in ice to a different depth, ranging from only the waist down to complete The circle is divided into four concentric zones. Named after Cain, is home to traitors to their kindred. The souls here are immersed in the ice up to their necks. Traitors to political entities, such as party, city, or country, are located here. The souls here are immersed at almost the same level as those in Caïna, except they are unable to bend their necks. Traitors to their guests are punished here. The souls here are immersed so much that only half of their faces are visible. As they cry, their tears freeze and seal their eyes shut- they are denied even the comfort of tears. Named for Judas the Iscariot, Biblical betrayer of Christ, is for traitors to their lords and benefactors. All of the sinners punished within are completely encapsulated in ice, distorted to all conceivable positions. Condemned to the very center of hell for committing the ultimate sin (treachery against God) is Satan, represented as a giant, terrifying beast. He is waist deep in ice, and beats his six wings as if trying to escape, but the icy wind that emanates only further ensures his imprisonment. He is chewing on Brutus and Cassius, who were involved in the assassination of Julius Caesar, and Judas Iscariot. What is seen here is a perverted trinity. Satan is impotent, ignorant, and evil while God can be attributed as the opposite: all powerful, all knowing, and good. The Question is: Are we seven hundred years after the birth of the ‘Divina Commedia’ able to understand Dante’s world and relate to Dante’s symbolism. My answer is defintely. Not only because Dante’s Inferno is now an action-adventure video game . The story is based on Inferno, the first canticle of Dante Alighieri’s Divine Comedy, and shares many similarities with the poem. 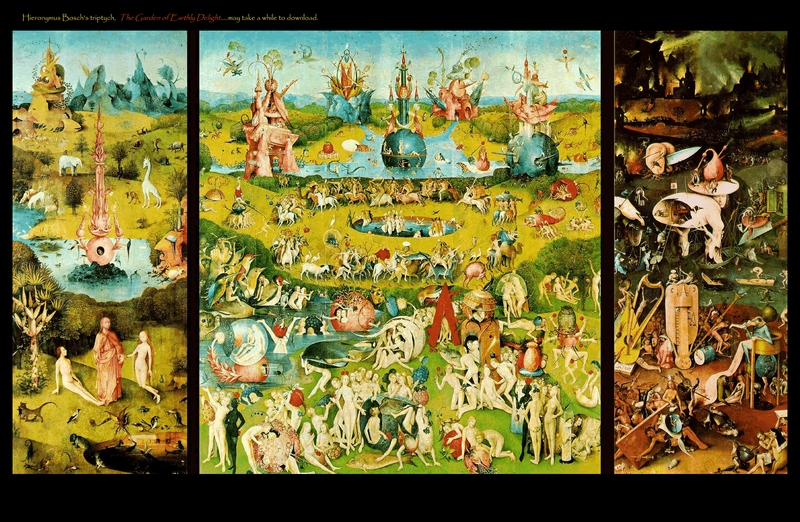 Tags: Archetypes, Art, C.G.Jung, Christianity, Dante’s Divine Comedy, Humanism, Philosophy, Psychology. Bookmark the permalink.